Red Sox Get All A's Again, 6-2. Burkett was Outstanding, Goes to 4-0. Will Burkett Bring his A-Game Tonight? TROT OUT WITH VIRAL INFECTION, TAKES SUSPENSION NOW. Nixon back on Saturday. Daubach in right tonight. Manny to Stay in Miami until Next Week. First off the tee is Bryant Nelson. Classic call from Pawtucket to fill Manny's slot. No surgery for Ramirez right now, finger splintered, but fracture "could migrate" according to Doctor Bill Morgan. Moorad sends Manny home to Miami to see the venerable Doctor John Uribe of Florida Marlins fame. Fallen star may not return until mid-July. Hand Specialist Doctor Bill Gives Ramirez Leg Up on Recovery. "I try to teach guys (to slide) feet first, especially going into the catcher." Did Pedro Find It? 10-4. Stopper Stops the Bleeding. Cubbage Patch Coaching Cost Sox Lead, Manny. Ramirez fractures finger on bone-headed play. Sox lose second straight in Seattle. Manny being examined at St. Elizabeth's today, may be out for a month. It's a whole new ballgame. Oldie? Offy? Daubee? Mikey? Clemente gets the backup call?! MVP, Rookie Run Over Road Sox. Streak over, M's win opener. Sox On Cloud Nine, Blue Skies Ahead. Nine in a Row. Sox Keep Rolling 5-1 over A's. Derek does it again. Jose and Shea go long early. Sox Ready to Slew Seattle. Rickey to consult family on retirement. Sox roll 12-6 for straight eight. Trot Gets a Grip, Sox Don't Slip on Trip. Seven in a Row. DIRT DOG CAN'T GIVE MLB THE SLIP! YANKEE GM SUSPENDS NIXON FOR FOUR GAMES. CASTILLO FOR FIVE. ONLY A FINE FOR RUPE. Sox Hold on 5-3 for Four Game Sweep. Everybody Gets Involved. Castillo Stings Rays. Sox win 2-0. Offerman Winning Sac Fly, Garciaparra Home Run, Urbina closes out at 96mph. Dirt Dogs Do Their Little Turn on The Catwalk. Dogs use 9 lives in 9th inning again, claw their way past Tampa Bay 7-5. The Shea Hey Kid is Back for a Nightcap. Pinch Hit Grand Slam Seals 9th inning comeback for second night of trip. How Lowe Can He Go Tonight? Sox come back from the brink to beat Rays. Wild throw saves the day. Sixers Can't Handle The Truth! Burkett Starts Trip Against Tampa. Ramirez Homers Twice, Adds 5 RBI to Lead MLB with 31. Ailing Pedro Gets 4th Win. 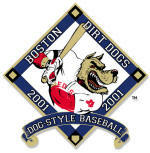 Dirt Dogs Homer too. Derek has his day. Pedro's night to remember? Darren runs the table. Complete game shutout.